When we bought our house in 2013, one of our main critera was "walkability." We wanted to live somewhere that allowed us to easily walk to the places we frequented. Park. Restaurants. Coffee. Library. Post office. Grocery store. One thing we didn't think of: sledding hill. 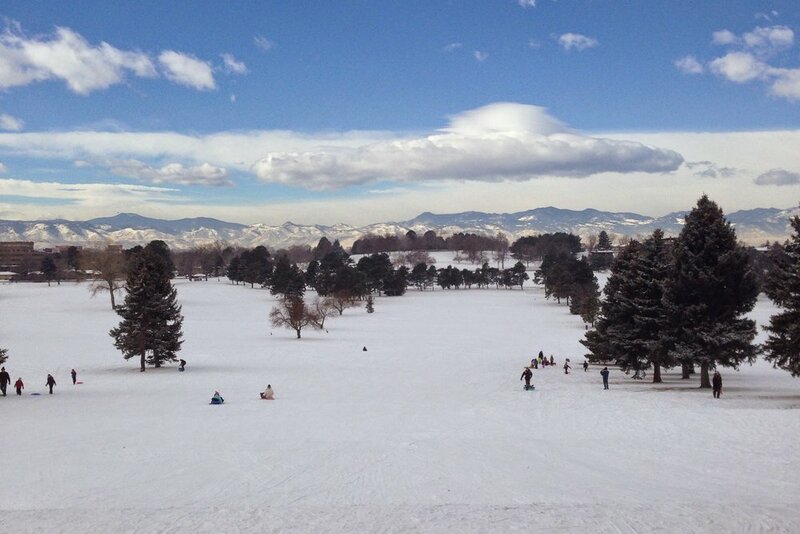 After the snow fell at the end of 2014, there was one thing on our mind: going sledding. At two and a half, this winter Willa is old enough to partake, and Dan had prepared us well by arranging for Santa to bring her a shiny, new, inflatable sled. Even though it's a bit of ordeal to bundle everyone up and strap each child in a carrier, it's so much more enjoyable to walk there than to take the car. (I swear, car seats and winter just don't mix. The coats are too bulky! The snow and slush get all over the place. The buckles won't tighten. Grrr.) It's just so nice to get some fresh air and (cautiously) catapult yourself down a snowy hill. I love the community it brings out: parents and kids of all ages, hot cocoa and other libations, dogs, smiles. Good times. Cameron even took one run with me. He was sound asleep. I'm sure it was memorable for him!